This is why you should make yourself beautiful accessories for all of life's adventures...or get other people to make them for you. This is one of my favorite bags. 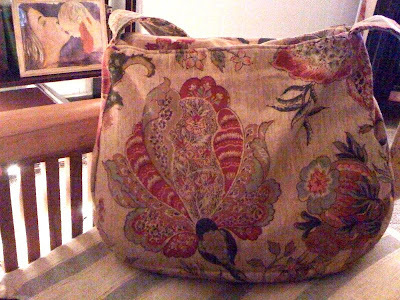 It's pretty, and it's functional, and has big pockets on the inside. It has a zipper in the top and a nice long strap. And every time I look at it I think of Barcelona. I think of sun, and walking around the city, and existing non-verbally for a week because I don't speak Spanish or Catalan, and not caring. I remember delicious food and dancing until 7am drinking amaretto and Spanish wine.